Congratulations to Erika Wood from Silver Memories! You are the IMG April Customer Service Superstar! 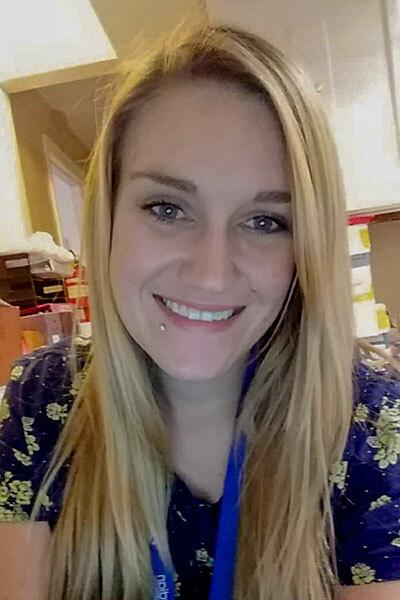 Erika has been dedicated to our residents since February of 2016, and is a compassionate CNA that makes our residents feel important and comfortable. Erika is attentive to their wants and needs, and does an amazing job at reading our residents. She knows their bad days to their good days. If something appears to be different about them, she will make a point to address what is going on, tries to uplift them, and is awesome at reporting to the charge nurse. Erika knows her residents. She knows what little things they like, like what time they like to retire for the night, whether they like one sugar or three sugars for their coffee, to their midnight snack. Erika always goes over and beyond. It is not uncommon for Erika to personally throw her resident a birthday party, dress them up for a night out on the town or assist in coloring their hair purple. If it is important to a Resident or something they want then it is important to Erika to make it happen. When Erika is here, the residents are happy and content. She not only meets their wants and needs but always does so in a cheerful manner. Regardless of what Erika has going on in her personal life, with preparing to be a brand new Mommy, recently losing a very close family member, to moving to a new house, and all life stresses, she has made a commitment to her residents. She never comes into work with nothing less than a positive, compassionate and caring attitude. She is always ready to fulfill her responsibilities. We are grateful to have Erika as a part of our team. We appreciate her not only fulfilling her responsibilities in her job but always exceeding our residents’ expectations. Erika is a true role model for the type of outstanding customer service each resident deserves. Thank you, Erika, for your devotion, kindness and commitment to our Residents!! !